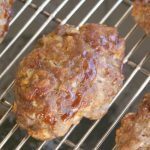 These Mini Meatloaves are delicious and quick to make! If you make them in the Nuwave Oven it will be quick and won't heat your kitchen up! First put all your ingredients into your stand mixer bowl and use your dough hook to mix the ingredients. If you don't have a stand mixer you can put the ingredients into a large bowl and mix by hand. You may need to use your hands to really get the ingredients mixed well. Form small loaves with the meat mixture using your hands. Place the loaves onto the Nuwave Oven rack. If desired you can put a small amount of BBQ sauce on top of the mini meatloaves and spread around with a knife. Cook times will vary a little based on how thick/large you make your mini meatloaves. I cooked mine about 7 minutes and then flipped them over and cooked another 7 minutes. When you think they are done you might want to cut one open to make sure it is cooked well inside! You can always add a minute or two at a time until done.